Copyright: ©2018 Tagiyev A, et al. This is an open-access article distributed under the terms of the Creative Commons Attribution License, which permits unrestricted use, distribution, and reproduction in any medium, provided the original author and source are credited. 4 year old boy visited to our hospital with a prolonged fever, fatigue and runny nose. An interesting finding of his bone marrow aspiration did show a Mott cell which let us to think a possible viral infection. Ebstein-Barr Virus (EBV) serology and polymerase chain reaction (PCR) were both positive. A diagnosis of EBV was made. Mott cells are bizarre plasma cells were named after a surgeon F.W Mott, who successfully traced these cells in 1901 in the monkey brains with trypanosomiasis . Mott cells characterized by an accumulation of multiple Russell bodies, globular cytoplasmic inclusions composed of immunoglobulin. These cells were plasma cells and indicate chronic inflammation. These plasmacytes were originally associated with parasitic disease, viral infections and hypergammaglobulinemia. Mott cell may also be found in some malignant diseases . In this case we will present a rare association of Mott cell and EBV infection. A 4 year old boy was admitted to our hospital with a complaint of prolonged fever, fatigue and runny nose. Physical examination revealed bilateral submandibular and cervical lymphadenopathy with a mild hepatosplenomegaly. There was no history of vomiting or diarrhea, skin rash, abdominal pain and headache. On admission he was looking well with a febrile T: 38°C, HR: 120/min RR: 30/min, BP: 100/65 mm Hg and his capillary refilling time was 2 s. Other systemic findings were normal. Patient was treated as a case of pyrexia from unknown origin and administrated oral Amoxicillin Clavulanate (45 mg/kg/day every 12 h for 7 days), but with no improvement in his symptoms. Laboratory tests including (complete blood count CBC), peripheral blood smear and liver & kidney function tests were normal except slightly elevated ALT 60 U/L, AST 53 U/L and CRP 3.32 mg/dL. Ultrasonography revealed a bilateral cervical (37 × 18 × 15 mm) and submandibular reactive lymphadenopathy, hepatosplenomegaly. Bone marrow aspiration showed a slightly increase number of histiocytes, plasma, and myeloid cells which ruled out malignancy. An interesting finding of this bone marrow aspiration did show a Mott cells which let us to think a possible viral infection. Ebstein-Barr Virus (EBV) serology and polymerase chain reaction (PCR) were both positive. A diagnosis of EBV was made (Figure 1). Figure 1. 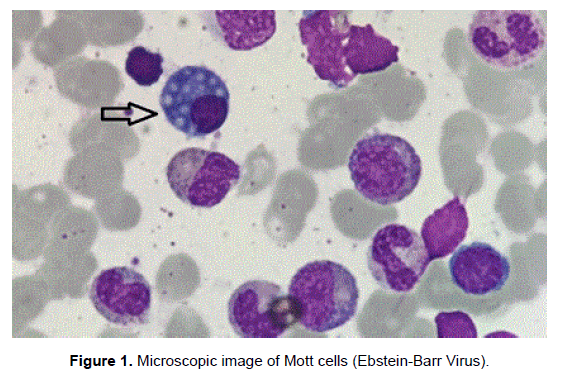 Microscopic image of Mott cells (Ebstein-Barr Virus). Epstein-Barr virus, a gamma herpes virus, is one of the most common infections all over the world. Although most children with EBV infections usually have mild or no symptoms, some children or adults manifest symptomatic full-blown infectious mononucleosis. The cardinal symptoms of infectious mononucleosis are the well-known triad of fever, pharyngitis, and peripheral lymphadenopathy, especially involving the posterior cervical chains. A minority of patients have splenomegaly, gastrointestinal symptoms, rash and headache . Mild to moderate elevations of liver Manuscript Click here to download Manuscript Revised EBV.docx enzymes are seen in up to 80% to 90% of patients . Children with EBV infection tended to have rashes, significant neutropenia, abdominal pain (older children only), and possibly hepatosplenomegaly. Other clinical sign EBV infection tonsillopharyngitis, malaise, fatigue, nausea, vomiting and anorexia . In our case patient had mild neutropenia, lymphadenopathy and hepatosplenomegaly without tonsillopharyngitis and abdominal pain. Sometimes EBV infection had serious complications like this psychological and respiratory problems, meningitis, encephalitis, Guillain-Barre syndrome, aplastic and auto-immune hemolytic anemia, splenic rupture, myocarditis and hepatic necrosis . None of these complications were observed in this case. In peripheral blood smear there was neither atypical lymphocytosis, nor Downey cells. To exclude malignancy we did bone marrow aspiration and find interesting cell type- Mott cells which may see rarely in EBV infection . It was reported that proliferation of Mott cells is also rarely observed in non-hematopoietic tumors, malignant epithelial neoplasms . Plasma cells normally produce and secrete immunoglobulins. This protein product may appear in different forms within the cytoplasm. When production within particular plasma cells is increased or when there is a blockage in secretion, accumulation of immunoglobulin occurs. This finding can occur in mature, immature, or malignant plasma cells. ÃÂ°mmature or atypical plasma cells in the bone marrow or, less commonly, in the blood are associated with a variety of plasma cell dyscrasias, including multiple myeloma, lymphoplasmacytic lymphoma and amyloidosis . Mott cells are plasma cells characterized by an accumulation of multiple Russell bodies, globular cytoplasmic inclusions composed of immunoglobulin which may occasionally observed in EBV, plasmocytoma, myeloma, trypanosomiasis . In our patient physical and laboratory examination excluded plasmocytoma and the other disorders. Mott cell can be finding in reactive plasmacytosis and some viral infections. EBV should be considered when Mott cells are present in the bone marrow aspiration or peripheral blood smears obtained during diagnostic evaluation of prolonged fever. Ravath M, et al. Mott cells-at a glance. IJCMR. 2006;37:309-315. Shinozaki A, et al. Prominent Mott cell proliferation in Epstein-Barr virus-associated gastric carcinoma. Hum Pathol. 2010;41:134-138. Al-Refaee F, et al. A case report of pediatric Epstein Barr virus (EBV) related cholestasis from Al-Adan Hospital, Kuwait. J Pediatr Pediatr Med. 2015;5:23. Yang SI, et al. Clinical characteristics of primary Epstein Barr virus hepatitis with elevation of alkaline phosphatase and γ-glutamyl transferase in children. Yonsei Med J. 2014:55:107-112. Moniri A, et al. Acute Epstein-Barr virus hepatitis without mononucleosis syndrome: a case report. Gastroenterol Hepatol Bed Bench. 2017;10:147. Odumade O A, et al. Progress and problems in understanding and managing primary Epstein-Barr virus infections. Clin Microbiol Rev. 2011;24:193-209. Lardhi AA, et al. Rosai-Dorfman disease complicated by autoimmune hemolytic anemia in a child: A case report and review of the literature. Case Rep Oncol. 2018;11:55-62.